The Burmese army's continuing attacks on the Shan State Army–South (SSA-South) despite a ceasefire agreement reached earlier this year will be discussed with President Thein Sein, a chief government peace negotiator has told the group. Railways Minister Aung Min, who has reached a series of ceasefire deals between Naypyidaw and Burma's ethnic armed groups, made the promise on March 26 in response to a letter the SSA-South sent three days earlier, according to Maj Sai Lao Hseng, a spokesperson for the ethnic Shan armed group. “He told us that he and his peace team will meet the president soon to discuss how to solve this problem. But he didn't say when the meeting would take place,” said Sai Lao Hseng. Government forces have clashed with the SSA-South 14 times since the two sides signed a peace agreement on Jan. 16. The group said in its letter to Aung Min that it had suffered a number of casualties in these attacks, and that Burmese soldiers had also taken weapons abandoned by retreating Shan troops. Many of the confrontations occurred when government troops entered SSA-South territory without advance notice, in violation of the terms of the ceasefire agreement, the group claimed. Thein Sein has vowed to end ethnic armed conflicts and even ordered Burmese troops to stop fighting rebel militias. 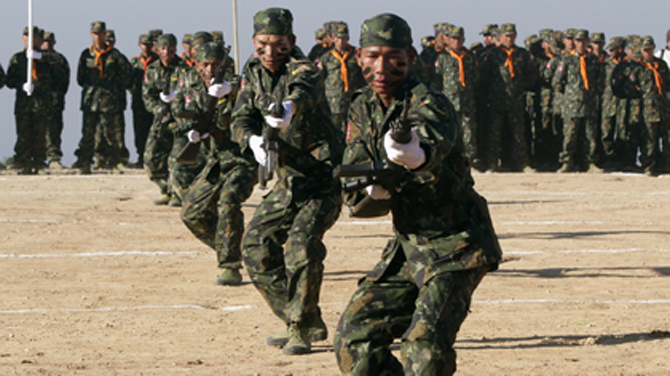 Despite this, government armed forces are still locked in battle with the Kachin Independence Army in northern Burma. Meanwhile, the Arakan Liberation Party is going to travel to Rangoon in the first week of April for peace talks with a government delegation. The Karen National Union is also scheduled to hold talks with the government in Rangoon following an initial peace deal reached in January.